Ebonthread plants are valued for the fibrous material of the same name, which is harvested to create resilient clothing. 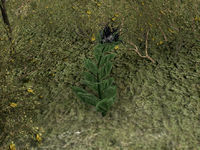 Echatere Moss is a plant that grows in Wrothgar. It is sometimes confused for a weed because it thrives in freezing temperatures. Believed to be quite healthy, echatere are known to graze upon it, but its also been used in Orcish cuisine. 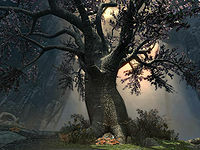 The Eldergleam is an ancient tree, thought to be one of the oldest living things in Tamriel. It is located in a cave in the volcanic tundra of Eastmarch, one of the Holds of Skyrim. It is sacred to worshippers of Kynareth. Elf Cup mushroom has a dark pink inverted cap, that fades to a lighter color on the outside of the 'cup'. 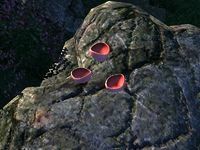 They mostly grow on the rocks of the West Weald region of Cyrodiil. Emetic Russula have a red domed cap with a white stem. 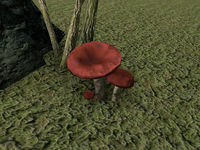 They can be found across Tamriel, although they grow mostly around the West Weald region of Cyrodiil. 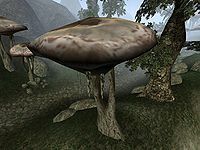 Emperor Parasol Moss can often be found hanging from Emperor Parasol mushrooms native to Morrowind. Moss hanging from the Emperor Parasols on Solstheim is known to be used in alchemy. This page was last modified on 6 November 2018, at 12:48.